It has been generally accepted that Charlie Hall appeared in 46 films with Laurel and Hardy. In the invaluable tome Laurel and Hardy by John McCabe, Al Kilgore, and Richard W. Bann, it is noted that he worked with the boys in 47 films – but this included Charlie’s deleted appearance in Oliver the Eighth. All filmographies to date only show Mr. Hall appearing in 46 films with Stan and Babe, but now it can be reported that Charlie Hall actually appeared on screen in 47 films with the boys. 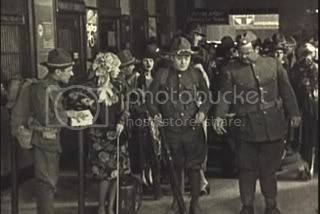 In this early scene from With Love and Hisses (1927), Charlie Hall can clearly be seen standing by as Cuthbert Hope destroys Top Sergeant Banner’s chances of ever getting that infernal cigarette rolled. This film has never been included in Charlie’s filmographies. The Wax Apple told you first! Congratulations, well spotted, another first, What an informative website, It’s amazing how much info. can still be uncovered about L. & H. films It just goes on & on.